Are you planning to upgrade your classroom technology in the next year or so? To help guide future purchasing decisions, you should conduct a technology assessment to determine how effectively you’re using technology in the classroom and what educational technology tools could help your students and your schools succeed. Start by reviewing your district or school’s five-year plan. How well are you moving toward those goals with the technology and curriculum tools you have now? What tools are outdated or don’t provide reliable service? What are the main elements you plan to focus on in the future? Are you changing the teaching standards? In what areas do students need the most improvement? Once you’ve identified the areas where you’ve found success and those that need the most attention, you can begin looking at tools that can help your teachers use technology in the classroom to more effectively achieve your curricular goals. Feel free to look at blogs, periodicals and your PLN (personal learning network) to find ideas for technology tools and uses that will help you reach your goals. Ask around on Twitter and search for the #edtech and #edchat hashtags to see what people are saying about different technology options and how other schools with similar long-term objectives have achieved success with technology transitions. After you explore what’s out there and what your peers are doing successfully in their schools, look at your current tools. Are the technologies up-to-date? Will you need to replace large quantities of what’s currently in use? What management systems will work with what you’re currently using as well as the new technology tools you’re exploring? Most importantly, you should evaluate whether your current technology and infrastructure will allow you to grow and take advantage of new learning methods in the coming years. Blackboard surveyed educational leaders to find out where they see education headed in the next few years, and blended and personalized learning were important focuses. If you’re not already offering blended learning or flipped classrooms, you may be looking to move in that direction in the next few years, and personalized learning may require high levels of technology intervention. Next, look at what technology is available for your teachers to test with their students. If you’ve been considering a 1:1 deployment for your school, where each student has access to their own district-supplied machine to use for learning, you could pilot a 1:1 deployment in one classroom or grade level to see whether it’s a viable option for your school system. Or compare different types of technology tools, such as tablets versus Chromebooks, to see what provides the most flexibility and best results. Or you could test a digital curriculum tool to see how well it helps students meet standards and objectives. A limited pilot of a new technology initiative will also help you work out any issues so that the full-scale deployment can be successful from day one. Get creative with your funding solutions. Download the white paper for a guide to securing funding for education technology. While teachers are piloting the different options for using technology in the classroom, spend some time exploring what your budget will allow in the way of technology purchases. Don’t forget to look at the professional development funds as well. 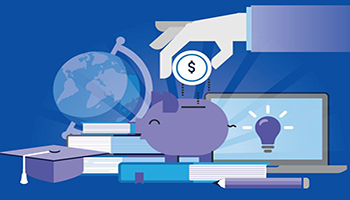 See how much funding you have available for new technology purchases and for related curriculum materials and professional development resources. Then examine how the different technology options you’re evaluating will fit into your budget. Will you need to pull funds from other budgets? Should you spread purchasing and deployment over multiple years? Or can you find an all-in-one option that combines technology, curriculum materials and professional development under one purchase, making it possible to cover the main deployment from one budget cycle? A technology assessment will ensure that those big purchases will help push your district toward your goals. And you might find that you enjoy it once you get started — experimenting with technology in the classroom lets you play around with new tools and find out how your peers are using them to do great things in their classrooms. Once you purchase technology for your school, how can you assess whether it’s making a positive impact? Here are some tips for determining the ROI on your ed tech purchases.